This document offers answers to different common questions about professional voice changers, soundboards and modulators with effects. As for example: What are the voice changers? How do these work? Are these illegal?. Voice changers or voice modulators are devices or software programs capable of changing the tone and formant of an audio signal, which in most cases comes from a microphone. These professional devices can perform this task online, real time or processing an audio file (WAV or MP3) already recorded. It-s common for mic morphers to include sound effects that serve to mask a sound. The first versions of professional voice changers were small hardware electronic circuits whose purpose was to be used together with a phone intended to disguise. With the passage of time they have begun to use to play phone jokes, play online, to customize the vocal tone in chat tools or to trolling friends and family. What is a voice changer? A voice changer can be an app, a software for pc, it can be integrated in a mask (if it is going to be used in a costume, for example) or it works as a toy for children. Voice changers are also considered instruments such as talkbox or vocoder, VST audio effects such as autotune or didgeridoo. In case of being an app this can be available for Windows PC, Android, OSX, iOS or Linux. Some voice changers in the apps are designed to make celebrity voice impersonations. What voice changers are safe? It is important to consider the safety of a voice changer before buying it in a store, either physically or online, or installing it on a PC or mobile device. If it is a hardware device included in a mask or a costume, it must be checked that it does not harm us. In case it is a megaphone or a toy microphone for children, it is necessary to check the indicated age to be used and if it can injure someone. In case it is a program for the computer or a mobile app it is necessary to check that it is going to be downloaded and installed from a trusted website, App Store or Google Play. How do voice changers work? The device, app or PC software receives the audio signal from a mic. When the sound signal has been detected, it is processed in real time using different types of effects: Panning, Delay, Echo, Reverb, Chorus. Distortion, EQ, Filters, Vocoder, Auto-Tune, Compression or Pichtshifter. Once the signal is processed, it is sent to the output device (speakers, recording program or headset). How to get or download a voice changer? If your question is "Where can I buy a Voice Modulator with effects?" There are many answers. In case you want a voice changer to disguise your voice and make them unrecognizable on the phone, you should go to a spy gadget store. If instead you are looking for a mask with built-in voice modulator and fun for a costume, the ideal is to go to a costume store or search online stores. 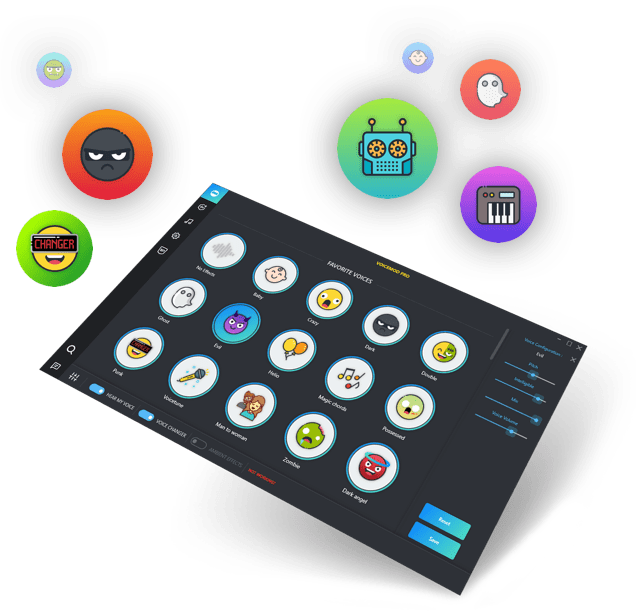 On the other hand if you are looking for a voice changer for chat tools or online games for PC you can download Voicemod at the top of this page. In case you need an Android or iPhone app to prank calls the ideas is to use App Store or Google Play to find applications that suit your needs. How to use a voice changer software on PC? 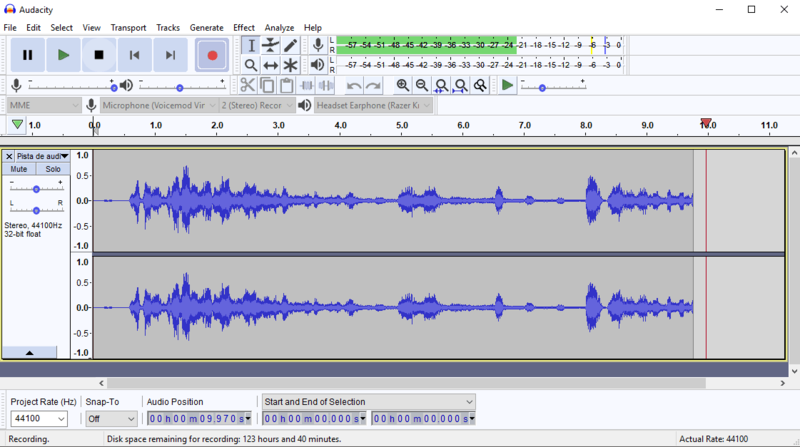 Download and install Voicemod in your Windows PC. Open it and configure audio options (mic, headphones and audio driver). Select your favourite voice and speak. Use it in chat software or online games for free. You can record your audio output or gameplays to share your funny content. Are voice changers illegal? Can you use a voice changer? This kind of audio processors to modify the tone and the formant of voice with effects are legal and can be used everywhere. What is not legal is to commit crimes by using a voice modulator for example to scare or bullying someone on social networks, or to disguise the voice to threaten someone in a phone call. If the goal using a voice changer is to have fun, it is not illegal. If you discover someone who uses software or a voice processing device to commit a crime, you should notify the police as soon as possible to take care of the problem. And remember there is no bad tool but misuse of this. Can voice changers be reversed? At first it is very difficult to reverse the effect that a voice changer applies to a voice. What is possible is to cancel part of the audio processing to be able to clearly identify an audio that has been modified. For this it is necessary to identify what type of sound effects have been applied to a sample to be able to counteract them using VST plugins or processors in an audio editor. For example, in case the voice sounds with a low tone, you can reverse part of the effect by raising the pitch and applying an EQ in the high frequencies. So you can reverse part of the effect of the voice changer. How to make a voice changer? If you want to make your homemade professional voice modulator hardware you will need electronic components (circuits, capacitors, microphone, cables, ...), a tin soldering iron and average electronics knowledge. It is complex to configure a device that has different effects and can also be in a mask, helmet or costume. It is a more complex, expensive and limited option than the options. 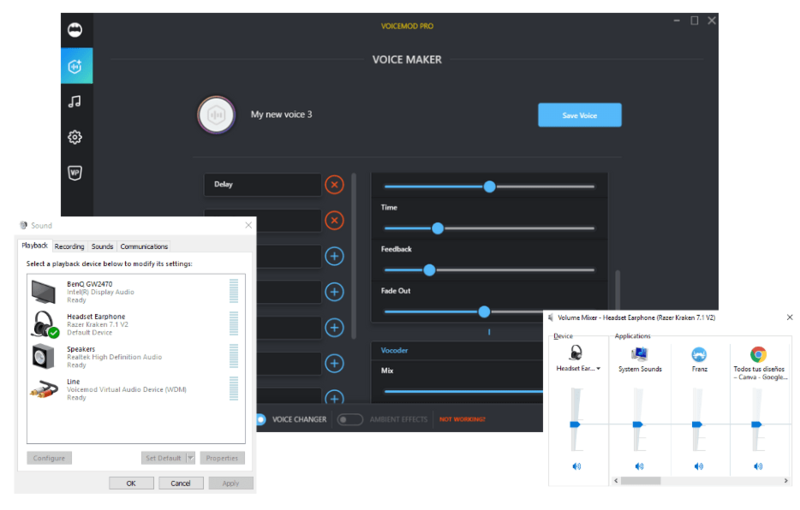 Download and install a voice changer software such as Voicemod on your PC. Run the app and configure your audio devices correctly. 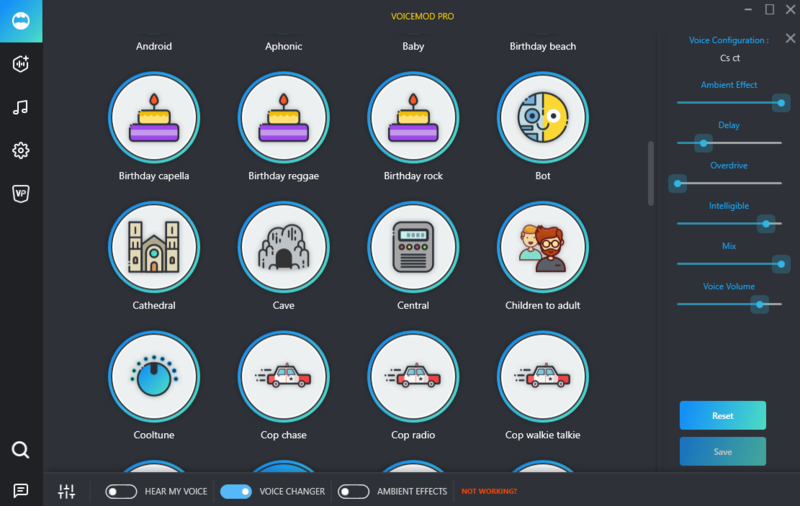 Select the voice you want to imitate in the main panel or create your own in the Voice Maker (a generator that lets you create custom effects chains). Now you can communicate in online chat or video games with your modified voice in real time.